Portraits of former San Jose State University presidents are reviewed for the “Portraying Possibilities” exhibit. Photo By Michelle Frey. As President’s Day approaches, San Jose State University is proud to unveil the first-ever exhibit of SJSU presidential portraits on the fourth floor of the Dr. Martin Luther King Jr. Library with an opening reception 3 p.m. on Wednesday, February 13. 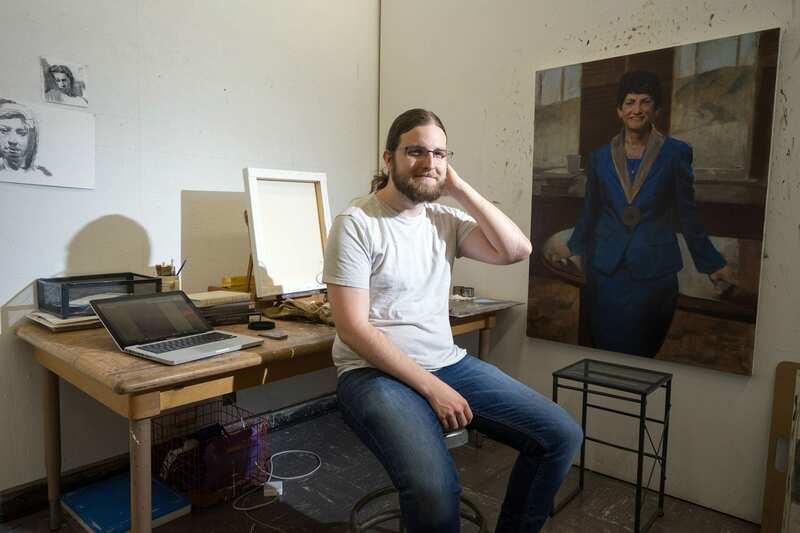 Entitled “Portraying Possibility,” the exhibit provides a glimpse of San Jose State University’s history through its leaders and will be on display through March 22. 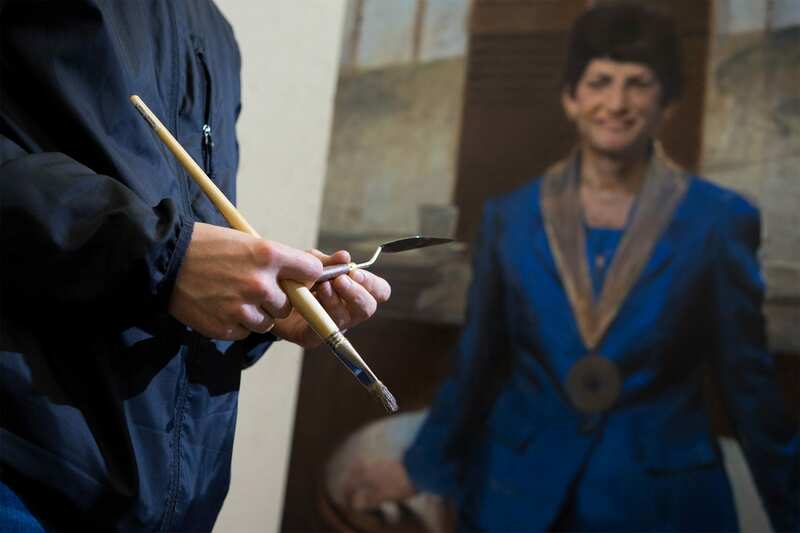 The nine oil portraits in this collection reflect the vision, values and dreams of the university’s presidents—including a new portrait of current SJSU President Mary A. Papazian, painted by artist and MFA candidate Daniel Cruit. 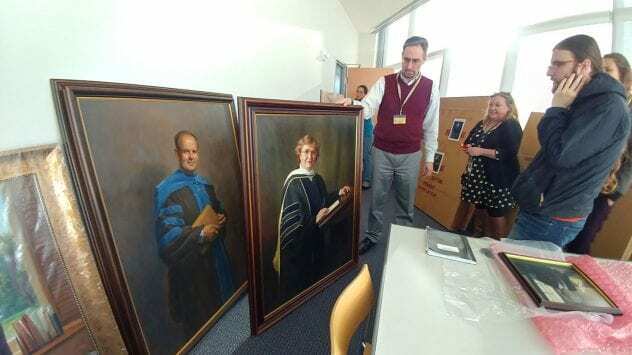 Photographs of additional past presidents and university leaders are included in the exhibit, along with two LCD screens featuring films that demonstrate the artistic process of creating a portrait, as well as current student artwork. Cruit is an artist trained in illustration who earned a bachelor’s of fine art from Ringling College of Art and Design (RCAD) in Florida. His work has earned accolades and been shown at several exhibitions including the Ringling College of Art and Design Senior Thesis Show, the Sketchbook Ringling College of Art and Design Sketchbook Show, and the Society of Illustrators Student Scholarship Exhibition in New York, among others. The show and reception is a collaboration of the College of Humanities and the Arts, the Dr. Martin Luther King Jr. Library and SJSU’s Special Collections and Archives. The reception will include remarks from College of the Humanities and Arts Dean Shannon Miller, followed by a short lecture by renaissance art historian and art lecturer Christy Junkerman. Junkerman has a bachelor’s in English from the University of Wisconsin, a PhD from the University of California, Berkeley, and teaches introductory theory as well as late medieval and early modern Italian art. She will discuss the history of portraiture. Following Junkerman’s lecture, Cruit will share insights into setting the scene for President Papazian’s portrait. Thomas William MacQuarrie, who led the university from 1927-1952 and has his name adorned on the south side of campus, expanding the campus and the curriculum while it was still known as a teacher’s college. John T. Wahlquist, who led from 1952-1964, established general education course requirements and promoted graduate programs. Robert. D. Clark, who led from 1964-1969, was the first president screened and nominated by a representative faculty group, and was known for setting an example of mutual cooperation and community relations. John H. Bunzel, who led from 1970-1978, who led the transition from a college to a university, and helped to establish programs in Religious Studies, Jewish Studies and Women’s Studies. Gail Fullerton, who led from 1978-1991, was the first woman to serve as president and the first faculty member to be promoted to the presidency since 1990, who promoted facilities enhancement that included a new engineering complex and the event center. J. Handel Evans, who served as acting president from 1991-1994, he led SJSU through accreditation by the Western Association of Schools and Colleges (WASC). Robert L. Caret, who led the university from 1995-2003, who promoted SJSU as the metropolitan university of Silicon Valley. Julia Halprin-Jackson contributed to this report.